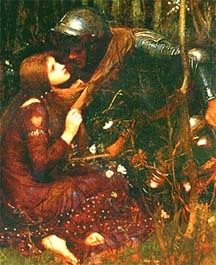 "La Belle Dame Sans Merci" by John William Waterhouse above shows the chivalry and innocence of the Libra nature when they find their partner. Libra's scent is Neroli (Orange Blossom), and Melissa, an ethereal essence that delicate Libra uses to encourage even the most reticent to believe in love. Love is in the air, and every Libra lives for love. A frisky period has you whistling love songs. This is a lively time for romantic Libra so put on your flamboyant new threads and go dancing. Your charisma beam is on high so just get out and be your bad self. Meditate in a natural setting to maintain a balanced outlook. Finances may improve in the lunar eclipse Thursday but, as Betty Davis said, fasten your seat belt; it's going to be a bumpy night. Someone prominent may provide an idea that shows you a whole mew financial direction.